Today’s activity can be seen displayed as the new banner across the top of this blog. I printed out a blank piano keyboard for the children to colour. So far E (my 4-year-old) is the only one who has completed hers, so it is her version you see at the top of the page. I gave her suggestions for which colours she should colour each note and showed her where to find them. 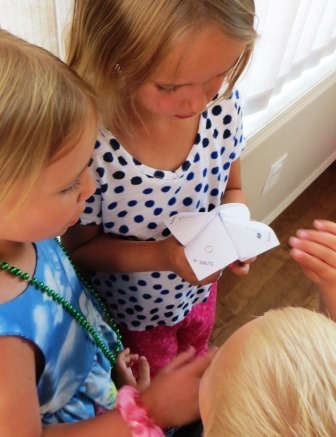 We’re getting crafty and making a rhythm chooser today. This idea came to me after the kids picked up free fortune tellers from our excellent local library as part of their summer reading program. I was going to put together a step-by-step, but it really seemed unnecessary once I came this very clear explanation on good ol’ Wikipedia. I put a semibreve (whole note), dotted minim (dotted half note), minim (half note) and crotchet (quarter note) on each corner of my chooser. Knowing the extent of my children’s musical knowledge I also wrote how many beats each of these was. If the kids were choosing I let them point or say how many beats they wanted and I then said, for example, ‘Ok, that’s a crotchet – the filled-in circle with a stalk – 1 beat’. If I was the one doing the choosing I would ask for the note by name, ‘Semibreve, please,’ and then if they looked quizzical I would point and say something like, ‘That’s the circle with no stalk, 4 beats’. On the next section I put 8 simple rhythm patterns, making sure to have a good balance of even and odd. We tried clapping these to make our choices with varying levels of success. 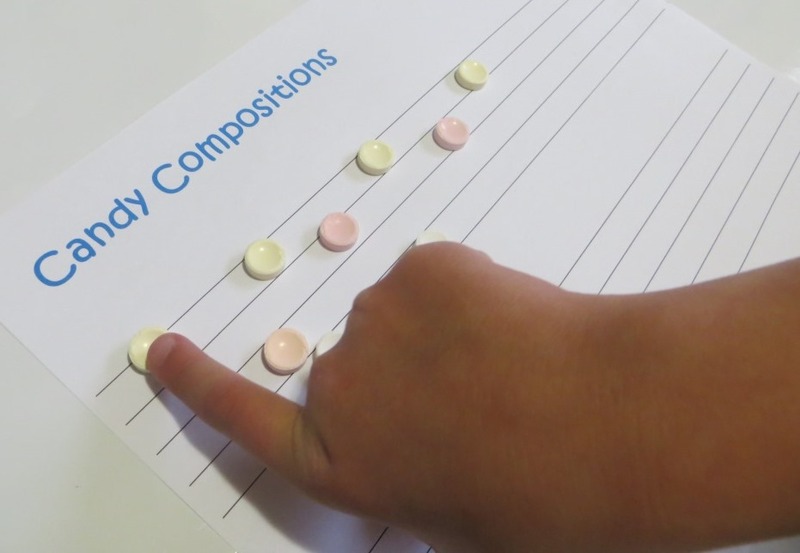 This was challenging for my younger two (ages 3 and 4) but they were able to count the number of claps and compare it with the number of dots even if they didn’t get to grips with the exact rhythms. With my eldest (age 6) I tried repeating with the Kodaly rhythm syllables (ta for a crotchet, titi for a pair of quavers etc – click here for a more complete guide) as I know she is familiar with that from her school music lessons. We came up with a variety of musical activities to put as our surprises under the flaps – from conducting along with orchestral music to finding middle C on the keyboard to dancing to a favourite song. I’m looking forward to making and decorating more choosers with the kids later. In the meantime I’ve uploaded a copy of the chooser we’ve been using; if you want to print this out you’ll need to cut off the bottom blank strip before you start folding. This first chooser is pretty amateurish, but if anyone is interested I can try to put together something more polished to share in due course – let me know in the comments.